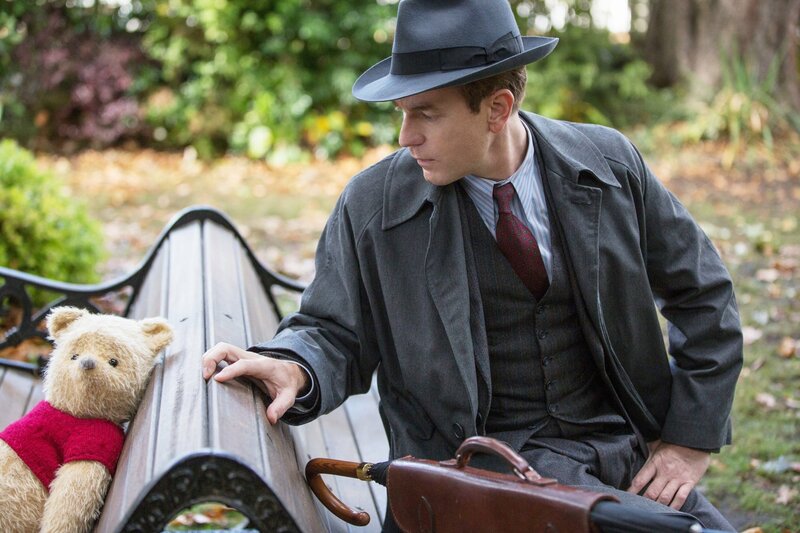 CHRISTOPHER ROBIN is a sad, depressing film that no child should see. Ever. Oh bother. As the warm glow of the amazing PADDINGTON – now two films in – persists, it was clear that another bear (the best bear by the way) was ready for his big day. Then came 2017’s misfire GOODBYE, CHRISTOPHER ROBIN which perhaps was meant to be more disturbing biopic than whimsical Pooh adventure. And so when Disney’s CHRISTOPHER ROBIN’s first trailer was released, it looked like my hopes for a triumphant return might be in the works. I am saddened to report that CHRISTOPHER ROBIN is nothing of the sort; it’s a sad and depressing film that comes alive too late in the game to recommend it to any child of any age. 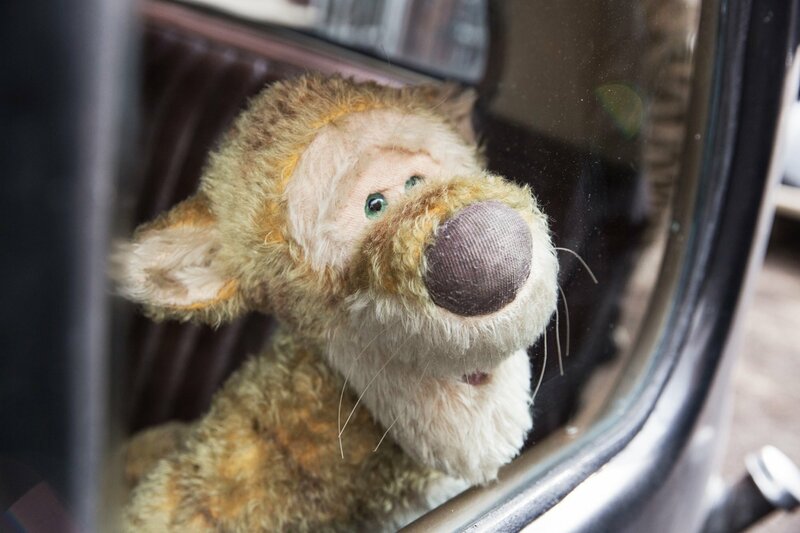 Christopher Robin is forced as a child to leave The Hundred Acre Wood and his talking stuffed creatures, including his favorite Winnie the Pooh (Jim Cummings). As time marches on, Christopher matures into an adult, marrying his war-time girlfriend (Haley Atwell) and producing the prodigious Madeline (Bronte Carmichael). Unfortunately, Christopher has along the way forgotten about Pooh, Tigger (voiced also by Cummings), Piglet (Nick Mohammed), and Eeyore (Brad Garrett), settling down into a dreary existence at a 1940’s luggage company. When his boss determines that cuts need to be made, Robin sends his family to the site of Christopher’s old home, unaware that Pooh has other plans. As the two meet after decades apart, Pooh and his friends will attempt to breathe happiness back into Christopher’s life, before both the company and his marriage fails. ROBIN is a misfire on so many levels. Director Marc Forster – known mostly for his terse QUANTUM OF SOLACE and WORLD WAR Z – seems to think that Winnie the Pooh is not only old fashioned, but that the world doesn’t need his sort gentle tomfoolery. When Pooh meets Robin as an adult, it’s even possible that Pooh has become a figment of Robin’s imagination, that the stress of work and the failure of his marriage are causing him to crack. While that’s understandable, it’s highly unlikely that a boy would forget about a cast of stuffed creatures who can actually talk. One would even think that he might allow others to share in that revelation, as does happen by accident near the end of the film. But the illogic of Forster’s dark film continues: there’s a moment about 60 minutes in when Robin is actually yelling at Pooh for getting them lost. Christopher can’t be bothered by the bear’s gentle kindness and his worry about the location of his missing friends. All Christopher wants is to get back to work and forget about Pooh. Huh? It’s one of many scenes where I suspect the audience probably turned away, but by this time nearly all of the children had already left our screening, leaving a confused mass of adults who expected something much lighter. This is not a children’s movie, but a half-baked commentary on adulthood that only works when the truly amazing animation meets Cummings’ absolute command of Pooh and Tigger. Cummings has lent his voice to countless Pooh adventures: he’s the go-to guy, a voice that’s helped raise a generation. Each time Pooh graces the screen, our hearts warm like pulling in a warm blanket over ourselves. But then there’s Forster and a team of writers, ready to extinguish that hope, placing Robin’s story above that of the very good Carmichael. In fact, their mistreatment of the characters suggests that none of them really knew the characters or had disagreements about how to bring them into the 1940’s, a mission that perhaps every child who loves the Winnie the Pooh could have done with one bear tied behind their backs. I could have imagined a different edit of ROBIN with Madeline on a great adventure to reawaken her father’s dying heart as she accidentally discovers The Hundred Acre Wood. And it seems like that might have been in the works, based on how well the film proceeds in the last 45 minutes. ROBIN works very well as a fish-out-of-water story, particularly when some of Pooh’s friends join him in London. Those scenes work very well, much in the same way they worked in both PADDINGTON films. In fact, all Forster and Disney needed to do was replicate that formula to achieve success and a bonafied franchise. But by the time that the London mayhem ensues, any good will that was extended by the audience has dried up. I will say there is one scene that should leave no eye dry, a tender and moving moment that was probably the basis of early script treatments. ROBIN is an example of how important the editing process is: cut this story into Madeline discovering Christopher’s friends and you have the next PADDINGTON. Try to make a biopic/family/high-stakes drama film, and you get CHRISTOPHER ROBIN. CHRISTOPHER ROBIN is not for children. It’s a sad and depressing film about how adults lose their way, but done in a manner that will sadden teenagers who grew up with Pooh and lead many little ones to ask way too often, “Where is Pooh?” It seems clear that our country right now needs stories that remind us of our humanity, that prove love and friendship trump tariffs and racism. That’s neither the tone nor the message behind ROBIN, and it’s ultimately why I can’t recommend this to anyone. CHRISTOPHER ROBIN is rated PG for some action and has runtime of 104 minutes. This week's Blu-ray releases for November 6th, 2018. MORTDECAI looks and sounds great in this not-so-awful home release.